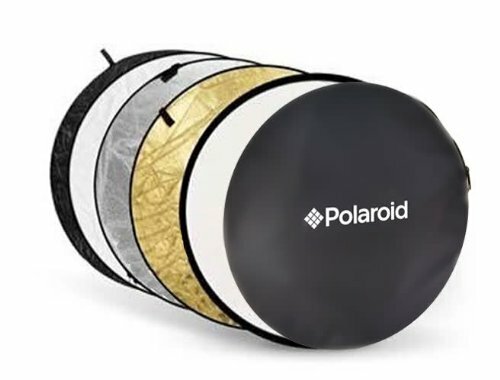 The Polaroid Pro Studio 5-In-1 Collapsible Reflector is versatile for your outdoors and in your studio photography, and is perfect for reducing contrast, warming skin tones, eliminating shadows or just softening light. It can be hand held or attached to a light stand with the Polaroid Extendable Reflector Holder. It is very lightweight, It will fold up to 1/3 of its size and It comes with a protective case for easy storage. 22":This size is perfect for head and shoulder shots or when you are tight on space and use of the reflector is critical. 32": This size is generally used in 3/4 adult portrait photography, 2 person portraits, full length child photography etc. 42":This size is used when you have a group of three or more and you want to get rid of those troubling shadows. White: Produces an even, neutral-colored bounce light that works beautifully as a fill light source for both product shots and indoor/outdoor portraits. Translucent: Translucent fabric is used to diffuse light, producing a broad light source and a soft, wraparound effect that's perfect for outdoor portraits or whenever a softer light is needed. Creates smooth, even reflections and give you control over your light source.